These glasses were tricky to photograph, so I apologize for the quality of the image. They are probably from the forties. The one in the middle is from the Edgewater Beach Hotel. 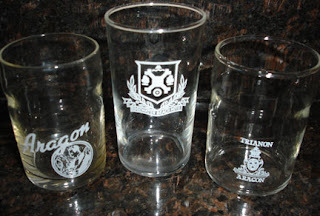 The one on the far left is from the Aragon Ballroom, and the one on the far right says Trianon/Aragon. The Trianon, once located at 62nd and Cottage Grove, was the most expensive ballroom ever built when it opened in 1922. It closed in the fifties, and was torn down to make way for public housing in the late sixties. Sister to the Trianon, the Aragon Ballroom was built in 1926 by Andrew Karzas, who also owned the Trianon. Karzas built the Aragon, according to historian Scott Newman, to "silence those who criticized the city's commonplace dance halls as unhealthy, immoral venues for the seduction of women, the practice of prostitution, and the then-illegal distribution of alcohol." I have them packed away at the moment, but in the near future I'll post some vintage blueprints and black and white images of the Aragon that I have in the collection. Where did you get these wonderful glasses. I wish I could find some from the Aragon. Special memories from the 1940's. I found one just like the one on the left, the Aragon one. Love it! Fun to find another online like it.